This practice example comes from the “Teacher trainig: Secondary Education, Vakstudie: Arts education’ program. In the second year, students should be able to digitize their graphic design. For this, they need to be able to create logos in Photoshop and photo editing software. However students’ prior knowledge about Photoshop is very diverse; for some students it is playful, while others still have to learn everything. We also have a lack of computers in the labs, which makes it difficult to get everybody to work simultaneously and to guide them adequately. 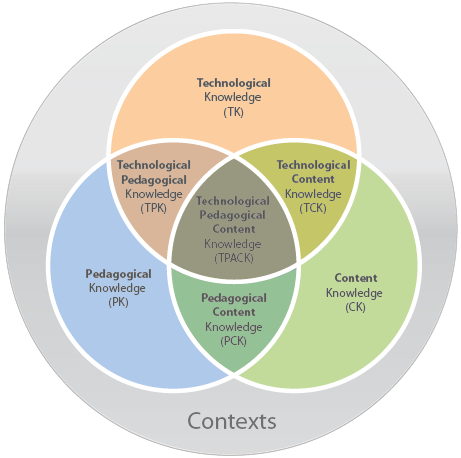 Click on the fields for more information about how the digital elaborated material (technological) was supportive for the subject matter (content) and for the didactical challenge (pedagogical) of the lecturer. In need of a theoretical basis?